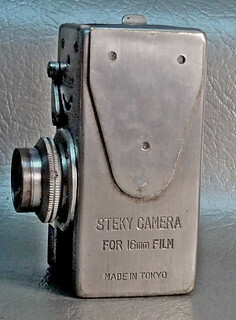 The Steky is a series of 16mm cameras introduced in Japan after WW2. At that time film and processing costs were expensive so 16mm cameras were very popular. Most of these 16mm cameras were of low quality and not much more than toys. 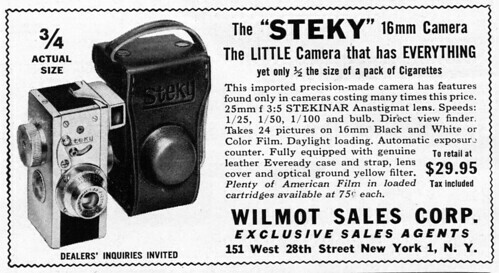 The Steky came with interchangeable lenses, variable shutter and aperture speeds in a very robust camera. 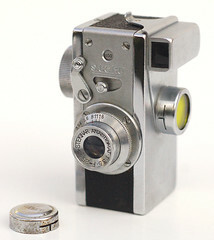 Some sub-mini enthusiasts still use these cameras by carefully loading their cassettes with perforated 16mm film. Once a common sight at camera shows the Steky is getting harder to find. The Hanken is a similar model to the Steky III, made for the Japanese Police. 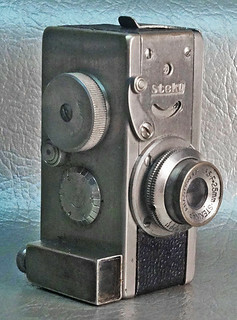 Very rare early model Steky c.1947. Viewfinder is on the winder side like the Nice. "Direction for use of the Steky". Reproduction of the Steky's English user manual. In Camera Collectors' News no.11 (May 1978). Nishinomiya: Camera Collectors News-sha. P.25. Sugiyama, Kōichi (杉山浩一); Naoi, Hiroaki (直井浩明); Bullock, John R. The Collector's Guide to Japanese Cameras. 国産カメラ図鑑 (Kokusan kamera zukan). Tokyo: Asahi Sonorama, 1985. ISBN 4-257-03187-5. Items 5138–42. 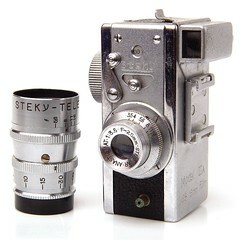 Steky at Mediajoy's Guide to Classic Cameras, click the "Next" link at the bottom of each page to have an illustrated sequence of operations. This page was last edited on 21 August 2017, at 10:29.